FRANKFORT, Ky. — Lawmakers have grown bolder in their push to allow farmers to grow hemp in Kentucky, a Bible-belt state where the issue was once considered politically taboo. Growing hemp is illegal under federal law, but supporters want to lift the state ban with hopes of Kentucky becoming a leading grower of the versatile crop if the federal ban is lifted. The House Agriculture and Small Business Committee held a hearing Wednesday on two bills pending in the state Legislature. Neither bill was called for a vote. Most Kentucky political leaders have dismissed the issue in the past because of fears that voters might somehow conclude that they’re also pro-marijuana. But the issue was a centerpiece in last year’s race for agriculture commissioner, which was won decisively by Jamie Comer, a hemp proponent. Comer said growing industrial hemp would allow expansion of Kentucky farm markets and create jobs in rural communities. Industrial hemp, a cousin to marijuana, is used to make fuel, cattle feed, textiles, paper, lotion, cosmetics and other products. Though it contains trace amounts of the mind-altering chemical tetrahydrocannabinol that makes marijuana intoxicating, it remains illegal in the U.S.
Ed Shemelya, regional marijuana coordinator in the Appalachian High Intensity Drug Trafficking Area, said police continue to oppose legalization of hemp because there’s no way to visually distinguish it from marijuana. “It’s an enforcement nightmare,” Shemelya said. State Rep. Keith Hall, D-Phelps, said he believes people are beginning to realize the potential economic value of hemp and that is allowing political leaders to feel more comfortable in promoting it. “I would say today that the issue is fear, and the great President Roosevelt said ‘what do we have to fear but fear itself,”’ Hall said. Hall said people might think it odd that “a Bible-read man” would speak in favor of allowing Kentucky farmers to grow hemp. “They’re saying the best Bibles are made with hemp paper over in France, because they don’t yellow; they don’t tear; they don’t tarnish,” he said. Sen. Joey Pendleton, D-Hopkinsville, said he expects the federal government will lift the ban on hemp production in the future, and that he wants Kentucky to be ready to plant the crop as soon as that happens. 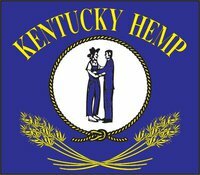 Kentucky has an ideal climate for hemp production and during World War II it was a leading grower of the plant that produces strong fibers used in fabrics, ropes and other materials for the military.